If it were to ask the Fat Hobbit, it would find that we were a sneak. But does he really know us? Hobbitses, they can call us names but that doesn't mean that's what we are! It may call us a sneak but it doesn't know what we are really doing, does it precious? Just because it calls us a sneak doesn't mean that we are a sneak. They don't decide who we are, do they precious? We decide for ourselfs! We are not a sneak. 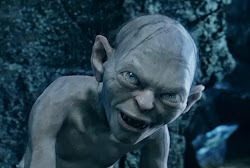 We are Gollum the Great! So when someone says what it is, remember that it can be whatever it wants! If someone says it isn't clever or beautiful remember that it lies! Yes, nasty hobbitses cannot tell it what it is. It can tell them. No one asked us for help with problems, so we are going to solve a problem of the Short Blogger's. She has lots of problems, yes, yesss. The Short Blogger tells us that she ruins her "sleep schedule." We watch her sleep to learn what she does. The Short Blogger, sleeping so beautifully. She thinks she must sleep earlier. But she is wrong! If it needs help with its sleeping too, it should remember to watch out for the Yellow Face and the White Face. Sleep, yes, it should sleep while the Yellow Face is high in the sky. Then the Wraiths can't see. They can't see it. Not while its sleeping and hidden. Then when the Yellow Face goes away, then it can go out. Catch nice fishes. But beware the White Face. Some nights he's there. Some nights he's gone. It can go out then. To fix its sleeping, it can rest when the Yellow Face is out. And stay awake when it ought to be out. Very soon, it will fix its sleeping. Yes? We helps it nicely? Do you think Aragorn should shave? We doesn't care about his face, but we think Strider would look better without a few of his fingers, yes precious.